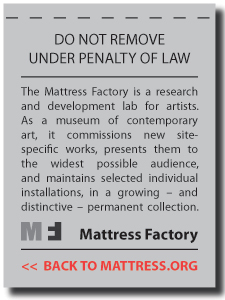 This is the first post in a three-part series dealing with the concept, implementation and outcomes of the Mattress Factory's SCREENtxt project. View post #2 HERE. I think it's safe to say that social media has revolutionized the way arts organizations are communicating with their constituents. Most would agree that social platforms like Weblogs, Facebook, Twitter, Flickr and the like – when used properly – are valuable tools for organizations operating under limited budgets as they attempt to facilitate an engaging dialog with audiences. Emerging technologies have made the potential for instant and meaningful communication a realistic possibility. And with a little bit of creativity, these days, the sky's the limit. I have been Tweeting on behalf of the museum for some time now. And don't get me wrong, Twitter is great. I enjoy being able to wax artistic with MF tweeps from all over the world, but what if a dialogue like this could extend beyond the percentage of people currently using Twitter into the realm of any MF visitor with a cell phone? The idea of communicating with visitors while they are on-site about the art they are viewing has been an attractive audience engagement concept for the museum. More than that, it would be even better if visitors could continue the discussion about MF art with past and future visitors after they've physically left the facility. So that's what we're attempting to do. Through a partnership with BrightKite, the location-based social network, we're launching an initiative we call SCREENtxt. Basically, SCREENtxt is a live text message (SMS) and photo stream populated by messages sent by Mattress Factory visitors and museum staff. UPDATE (2/23/2009): As of February 23, the BrightKite wall now integrates with Twitter. This makes it very easy for existing Twitter users to post directly to the wall without registering with BrightKite. 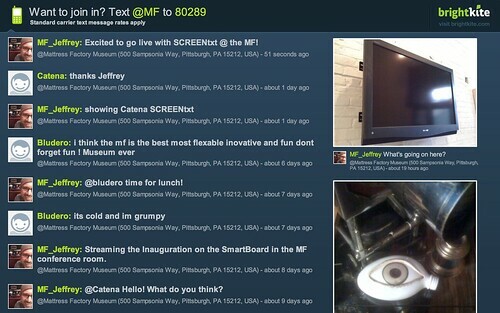 Now, any Twitter post containing the hashtag #MFtxt will appear in the Mattress Factory placestream. This also makes it very easy for those off-site to communicate with visitors on-site. We are currently revising our collateral material to reflect this new option. We've hung a 42" flat screen TeeVee in the museum lobby that will display text messages and photos sent by museum visitors. When available, and when appropriate, museum staff can pop into the conversation to answer questions or engage in the discussion. Participants will also be able to send direct messages to one another as long as they're opted-in to the service. All SCREENtxt activity can be viewed online via a sidebar portal here on the MF blog that links to this dedicated URL, the idea being that a participant who visited the museum weeks ago will be able to communicate with someone currently on-site about their MF experience. This looks really exciting. Will people have to sign up with Brightkite to do this, or is it easy to just text into the general feed? I see the sentence about that at the top of the screen, curious if there are secondary steps or if a non-Brightkite user can just text a message directly. Also, are you doing any profanity filter/active account management or is it wide open? I support open, mostly curious. Thanks for the comment. In the 2nd post I'll get deeper into the implementation/participation details, but BK makes it very easy for non-users to participate. Basically a two-step process...and that included selecting a username. Regarding content management, we're going to approach it in the same way we did for iConfess and try to leave it as open as possible. We only intend to pull content that violates the MF's mission or BrightKite's terms. So excited to see this project getting under way. I'm curious to see how people will use this virtual space and communication tool. "Participants will also be able to send direct messages to one another as long as they're opted-in to the service." Not exactly sure what "opted-in to the service" means, technically speaking, but the concept is really exciting--opening up roads of communication not only between museum to visitor, but between the visitors themselves? I think it has the potential to reinforce your community in a big way. And having a strong community is the foundation of success--both online and off. Can't wait to see how this pans out! Good luck. How do participants send a message? Do they send a text message via their phones? Are there kiosks throughout the MF? Are you handing out iPhones at the door? Visitors send messages via their own mobile device. BrightKite is cross-platform and has international capability. After leaving the museum, they can continue to post via cell or web. Very exciting stuff! I'm very curious about how the BriteKite + Twitter connection is working. It seems to be a much cleaner alternative to Twitter fountains and hashtags. And it looks like I need to make my way to Pittsburgh soon! Congratulations on launching this experiment. I can't wait to learn more in the next posts. I love that the evolution of social media seems to recognize the art world as a wealthy vein of content. It would be cool if there were an automated exhibit that sent out its own randomized texts to those who opted in as a way to stay connected with that particular work. "42 visitors today. Some kid spilled a coke on the floor. Guest lecturer this Friday."